It’s not about accommodating women. It’s about engaging your total workforce. Gender equality has evolved from being a women’s issue to being a business imperative that gives companies a competitive advantage. While much research has been done to try to figure out why women lag so far behind men in positions of senior leadership, the resulting knowledge shows that by the time women reach the top of organizations, their numbers are sparse, even though they entered the leadership pipeline in equal numbers compared to men. The issues of time in leadership, education and leadership capability have all been studied, as has salary inequity. Flexible work arrangements and leadership development practices have also been studied. While this is all-important information, it seems that we have not yet seen an explanation that addresses the root cause of this issue. The Conference Board of Canada claims that if “organizations are to achieve relative gender balance, significant change in talent management and leadership management practices will be required,” which points to proactive practices. Frail identifies critical proactive practices that impact a company’s bottom line. 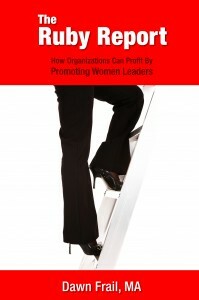 This book analyzes the knowing vs. doing gap by looking at the actual behaviours and (cultural factors) practices of organizations that are actually filling their senior leadership roles with more women than other corporations in Canada.Having policies in place doesn’t seem to be driving promotion rates for women. What are the associated behaviours of those organizations that are walking the talk, and what lessons can we learn from their efforts? Most organizations don’t have a clear strategy in place for developing women into leadership roles, so I chose to look into companies that do. Dawn Frail speaking to attendee at the Canadian book launch, May 6, 2014, in Mississauga, Ontario. 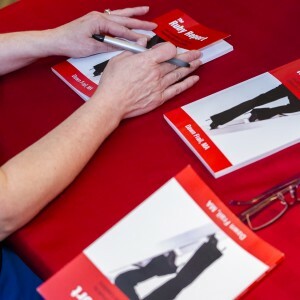 The book table at the May 6, 2014 launch of The Ruby Report in Mississauga, Ontario. 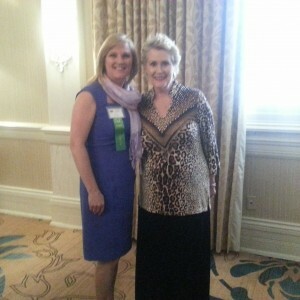 Dawn Frail with Publisher, Linda Ellis Eastman, at the PWN Conference & Book Launch, August 1, 2014, Louisville, Kentucky.